I was always enamored with motorcycles. In the summer of 1986, between my junior and senior year of high school, I was able to go out to a friends family farm, and there I finally had the chance to ride a small streetbike they had out in the barn. I must've dropped it a dozen times that first day I took it out, but thankfully I didn't do it any harm. In the end though, I was hooked. In the spring of 1988, I finally bought my own motorcycle, a 1986 Honda VF 500 Interceptor. Although I've dabbled in a lot of hobbies over the years, I always had a motorcycle around and motorcycling was one of my true joys. Unfortunately, I have retired from motorcycling due to a medical issue which we think can be aggravated by certain activities, sadly to include riding motorcycles. 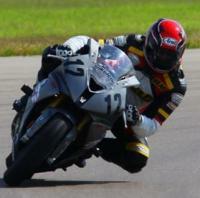 It has been with a very heavy heart I chose to leaving motorcycling. I'm very thankful for the opportunities I had from 2010 to 2015 to train with California Superbike School, both as a student in their 1-day and 2-day camps, and also as a CSS-mentored coach for the Marine Corps Advanced Rider Track Day (ARTD) Program. Under the watchful eyes of the phenomenal staff of CSS, I was able to learn and grow by leaps and bounds as a rider and coach. I don't want to leave anyone out, but I did want to give special thanks to Cobie, James, Lonnie, Jon and Mike for their hard work making me a better rider. And also, many thanks to Lonnie, Pete, JT, James, and Dylan for their hard work training me as an ARTD coach. Thanks guys!